Seafood lovers, including us, were in heaven at last week’s New Fish Festival at Gloucester House. For $30, we sampled from a huge array of appetizers and entrees featuring fish and shellfish. The idea behind this event, now in its 24th year, is to introduce people to new types of seafood and new ways to prepare already familiar fish. It was created and is co-sponsored by the Gloucester Fisherman’s Wives Association (GFWA), a non-profit promoting the New England fishing industry. 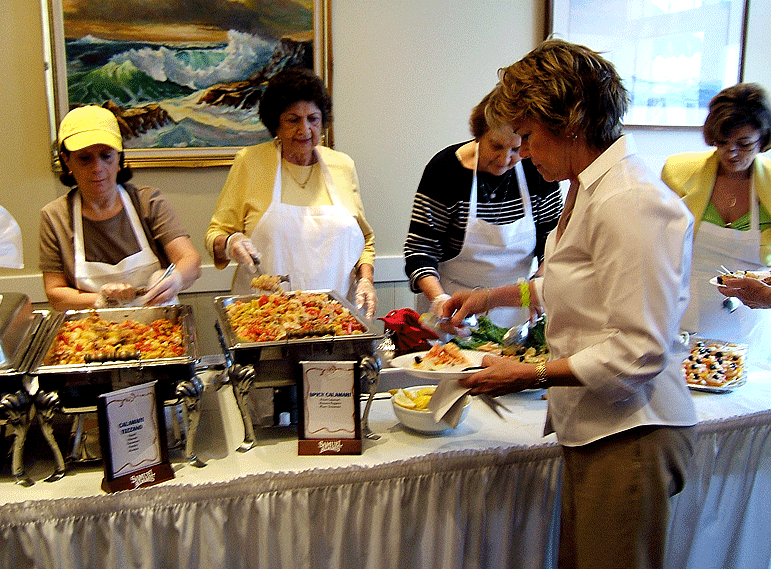 We made frequent trips to the buffet for appetizers from Gloucester House and GFWA. The seafood pizza was a winner, and we enjoyed the monk fish soup and the sicilian shrimp and orange salad. Our favorite entrée was GFWA’s sicilian baked fish, a wonderful mixture of cod, bread crumbs, grated cheese, tomato, onion, garlic, and oregano. A close second was the grilled salmon fillet from Lobsta Land. It had a lush lemon sauce and was served with creamy five-onion risotto. Not everything was a hit; we were underwhelmed by Gloucester House’s seafood mac and cheese, and the cinnamon chili dry rub on the butterfish from Passports was interesting but not entirely successful. But with 12 entrees, there was truly something for everyone, and the event provides the perfect setting to try fish dishes you might not usually order, including skate wing in garlic sauce and a wonderful trip back to old New England with Gloucester House’s fish cakes and beans. One of the simplest looking dishes, the filet of sole with spinach in a mornay sauce from Emerson Inn by the Sea, turned out to be flavorful and perfectly cooked. As a bonus, sheets with the recipe were there for the taking. We’re not surprised this event was well attended—for the price of one seafood entrée at most restaurants, diners can fill their plates with a variety of fish and experience cuisines from around the world. 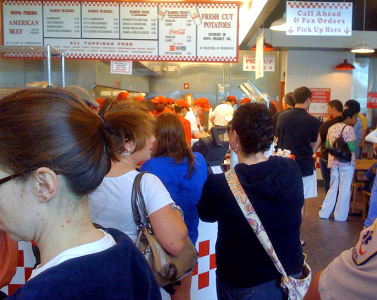 Even before the hype of President Obama’s recent Five Guys run, Lunch Guy was looking forward to trying out the franchise’s new branch, which opened this past Monday in Vinnin Square, because he’s a sucker for a good burger. After navigating the full parking lot, the long order line, the mysterious menu board, and the even longer pick up line, Lunch Guy finally grabbed a seat in the small, noisy restaurant to enjoy his burger and fries. 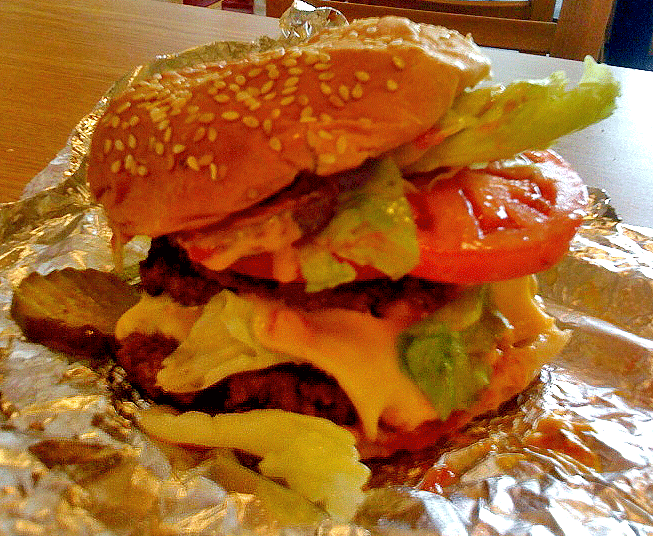 The first surprise was that the Cheeseburger ($5) was actually two stacked burgers. The Little Cheeseburger ($4) is a single. While they charge extra for bacon or cheese, all other sides are free. The burger itself was quite tasty, quality fresh ground beef in real patties, grilled and assembled with precision by the cast of thousands crammed in behind the counter. It’s the sort of thing you’d expect to be served in a pub, not a storefront burger joint. Despite only Coke and Sprite being shown on the menu, the free-refill fountain drinks ($2) offered a range of sodas. The fries ($2.79 small, $4 large), advertised as hand cut daily and cooked in no-cholesterol peanut oil, were not Lunch Guy’s favorite. While certainly fresh tasting, they were closer to the boardwalk style, and he prefers them crispy. Lunch Guy says the paradox is that it’s a sit-down burger experience in a fast-food environment, and the bottom line is that even though he enjoyed the burger, Five Guys isn’t likely to become a regular habit for him. He has a limited time for lunch and wants to relax while eating. With all the time spent waiting in line, (eight minutes from door to order, 10 to 15 to receive the order) he’s not going to have too much left to eat, and relaxing is out of the question with the noise and surging lunchtime crowd. The craziness and crowds should subside once the novelty wears off, but Lunch Guy leaves us with this tip: call in your order ahead or try grabbing lunch after 1:00, when the crowds have abated a bit. Lunch Guy is sad. His favorite place for chicken recently shut down. But a guy has to eat, so he’s begun frequenting Clucky’s Wings on Bridge Street in Salem. It’s not the deal that Chester Chicken was, but the fries are hand cut and the wings are top quality. Lunch Guy likes to go with the five-piece combo for $8. He gets five boneless buffalo wings with blue cheese dip, batter-dipped fries, and a drink. He goes with mild on the buffalo sauce, but those who love heat may want to try the blazing or even the inferno. And if you’re craving wings but your lunch partner is not, Clucky’s is the place to go. Both Clucky’s and its neighbor, Damatas, are owned by the same company, so wing people can satisfy their craving while others munch on pizza or subs. You know those places you drive by and think, “I wonder if that place is any good?” Well, more than likely, Super Sub/Chester Fried Chicken is not one of those places. Located at the intersection of Highland Ave (Rt 107), Essex St, and Boston St, it does not look like much from the outside. But Lunch Guy knows better. This clean, well-run lunch spot is a hidden gem, especially if you like fried chicken. It is run by a husband and wife team that cheerfully serve up subs, fried chicken, and Lunch Guy’s favorite: the chicken tender combo. For $5.25, he gets three white breast chicken strips, three potato wedges (about 1/4 of a potato each), and a can of soda. It comes with a choice of dipping sauce (Lunch Guy always goes with the honey mustard). If you know of a better place for fast, crispy, never-greasy chicken at a good price, Lunch Guy would like to know about it. As a tradesman, our Lunch Guy eats out four or five days a week. Bad for his cholesterol level, good for our readers—he’s scoped out the best places for inexpensive meals in Beverly, Salem, Peabody, Danvers, and more. Lunch Guy has had it all, from chicken to Chinese, but before we get to that, we have to pay homage to the best fast-food joint in the area: Nick’s Roast Beef. Nick’s is beloved by all in the Beverly/Salem area, and Lunch Guy says it’s for good reason. For starters, there’s the friendly service and the awesome roast beef. Lunch Guy likes the junior beef three-way (sauce, mayo, and cheese; under $5 with a drink). With Nick’s wonderful, not-greasy fries, of course ($2.50). But here’s the rub. The cheeseburger plate calls to Lunch Guy every time. It’s a huge burger grilled to order with fries, onion rings, and a salad. At $7, it’s a steal, since it’s more food than anyone can eat. One more thing—Lunch Guy says get there before noon if you want to get a table.